Here's everything you need to know to instantly become a para biathlon expert as Canada competes at the Paralympic Games in Pyeongchang, South Korea. 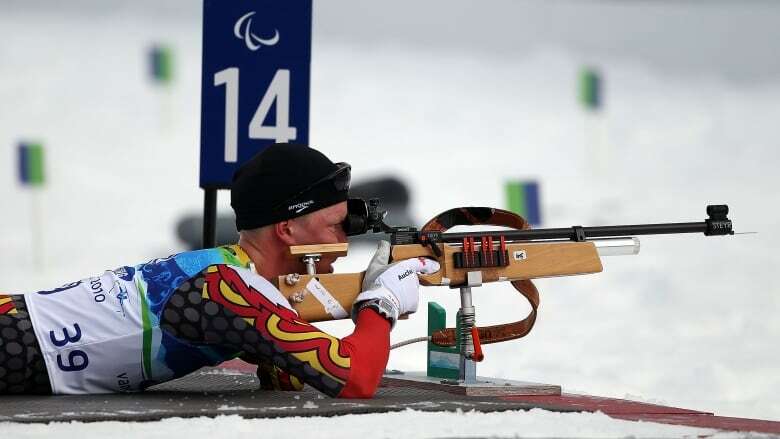 Para biathlon combines cross-country skiing and riflery in an event that requires a seamless transition from complete physical exertion to calm, accurate shooting. The sport — which along with cross-country skiing forms the para-nordic discipline — was first contested at the 1994 Paralympic Winter Games in Lillehammer, Norway. Athletes are divided into three categories depending on their classification: standing, sitting and visually impaired. Events consist of laps on a cross-country course range with shooting rounds at the end each lap. The number of shooting rounds vary depending on whether it is a sprint, middle-distance or long-distance event. Competitors must hit five targets that are 10 metres away before continuing with the skiing element. Athletes shoot at the targets from the prone position; targets measure 13 millimetres in diameter for the standing and sitting events and 21 mm in visually impaired events. Missed targets result in penalties for the athletes. For sprint and middle distances, a penalty loop must be skied for every missed target before returning to the regular course. The distance of the loop for sit-skiers is 100 metres, while athletes in the standing or visually impaired classification ski a 150-metre penalty loop. For the long-distance event, an extra minute is added to a competitor's total time for every miss. In this classification, electronic rifles equipped with headsets are used, with the headsets used to help the competitors locate the target using sound by omitting a higher pitch depending on how close an athlete's aim is. A hit turns the target green, while a miss turns it red. This is different in the standing and sitting events, where the target turns white for a hit or remains black if missed. Competitors in these events use rifles and targets similar to biathlon's able-bodied counterpart. Several Canadian athletes compete in both cross-country and biathlon events as part of the para-nordic discipline. Mark Arendz and Brian McKeever are the only Canadians to win Paralympic biathlon medals; Arendz won silver in bronze at the 2014 Games, while McKeever earned bronze in 2006. The 27-year-old Arendz enters the 2018 Paralympics on the strength of a strong showing at last year's para-nordic world championships; the Hartsville, P.E.I., native won five medals, including two golds and a silver in biathlon events. Sharp-shooting Brittany Hudak will compete in her second Games in Pyeongchang. The 24-year-old from Prince Albert, Sask., earned a World Cup bronze in December in Canmore, Alta.